“There comes a time in the affairs between governors and governed when every action by the authorities excites the people's contempt; and every failure to act excites their disgust." <?xml:namespace prefix = v ns = "urn:schemas-microsoft-com:vml" /><?xml:namespace prefix = w ns = "urn:schemas-microsoft-com:office:word" />Montreal has suffered through the kind of fiscal irresponsibility and pillaging of the public purse that afflicts many jurisdictions at all levels of governance. It is a universal problem at this time in this land. In the recent past Montrealers have quietly accepted staggering increases ranging from 36-48% in residential and commercial property taxes , with the latter threatening to create an epidemic of business closures since they encompass hidden business taxes, not seen since the late 1990s and that are now the highest in North America. Montrealers have remained quiescent in the face of the proposal to fine business tenants and property owners if they don't clean up public areas outside their properties. The fines range from $150-$2000. Isn't that the job of the city workers that the tax increases were meant to pay for? But the straw that seems to have broken the backs of the citizens is the increase in parking meter rates. Not only do Montrealers now have to pay more money for less time, but the maximum time limits don't even allow you to sit in a restaurant or shop at your leisure or even watch a movie without running outside to feed the meters. Factoring in the combination of more dollars and restricted parking periods, the increases reach 400% in some areas. Aside from the egregious money grab, by taking away free Sundays and extending Mon.-Wed. hours, the hikes are reflective of so much of today's nanny-state rule and regulation that is so intrusive into our private lives. The people's streets are no longer theirs. Our living time is rationed. And our pockets are being picked at every turn. Well some people have started to do something about it. Small petitions have arisen in several areas of the city. One of the most successful is that of restaurant owner Giovanna Giancapro who has several thousand on hers. But one of the most interesting, and damning, pieces of evidence that has come to light occurred through the efforts of community activist Sharon Freedman. In addition to calling on the expertise of social activists like Chris Karidogiannis who chaired the successful "Save Park Ave." coalition and bringing others into this new movement, she started to call and write and badger City Hall to find out why these hikes were necessary. She finally got a letter from a high ranking official whose answer hangs the city out on the proverbial pétard. He said that certain city councilors asked for the hikes in their areas and that some $1.8 million of the money was intended to go to the city's cleanliness campaign. Then he added that the meter rates were equivalent to those of some other Canadian cities. Freedman could not find any councilors who had asked for hikes. There were no public consultations. And as for the "cleanliness" campaign, wasn't that the reason for the new fines? As for the "equivalency" issue, the bureaucrat failed to mention that the other cities didn't have our high property tax rates. If you can't have "double jeopardy" in criminal law, how can "double taxation" be justified in fiscal matters? Does the expression "tax revolt" ring a bell with anyone? Since the "Save Park Ave." victory, Montrealers are feeling empowered. They understand the power of numbers and of coalition politics. When Freedman and some others approached the Institute for support we were more than happy to join in with our organizational assets and resources. This coalition wants the hikes reversed. And they want explanations as to what the city is doing with taxpayers' money when Montreal infamous potholes are now craters; the public transport system is in gridlock; 80% of the water mains leak; snow removal is still sub-par; and the police have been ordered to get busy giving jaywalking tickets -- yet another money grab. Any of this remind you of your town? These meter hikes are the straws that broke the camel's back. After the Park Ave. campaign Montrealers know they can fight City Hall -- and win! As Global reporter Paola Samuel said, "There seems to be a new buzz in the City. A feeling that the average person can speak out and be heard." And the people are sending a loud and clear message: "Montréal...assez c'est assez!" "Enough is enough." Besides my show on 940 AM, The Journal de Montreal, Global TV, CTV, Radio-Canada, and 98.5 FM have all focused attention on this fight. In the coming days the Institute will have an online petition site up and ready and we'll be urging everyone to sign. For this problem arises in Montreal at a time when every city is plagued by fiscal misfeasance. And there is just no more money to be squeezed from taxpayers. Just this past week Toronto's Centre for Policy Alternatives released a report demonstrating that the top 10% of Canadians have gotten richer over the past ten years while the rest of us are actually working longer for less money. Recently the CPA released another that showed an astonishing 48% of Canadians were just one paycheque away from financial disaster. One of the main reasons was high taxes. Whether direct or hidden as fines and rates. The confluence of rising government tax grabs and constricting personal incomes should not be lost on any government at any level of jurisdiction. For as John Reed once wrote, there comes a time in the affairs between governors and governed when every action by the authorities excites the people's contempt; and every failure to act excites their disgust. In Montreal that time has arrived. But Montreal is just the canary in the mineshaft. It will come to other cities as well. Citizens are on the march. And City Halls everywhere should tremble at their quake. In a mere three days last week, north-end restaurant owner Giovanna Giancaspro helped generate 3,000 signatures on petitions she circulated along Fleury St. E. to protest against parking-meter rate increases. The increases - as high as 25 cents for five minutes in the downtown area - were only mildly controversial when first announced last November in the city of Montreal's 2007 budget. But three months of simmering discontent is now threatening to escalate into a full-blown tax revolt against Mayor Gerald Tremblay's administration. Merchants from more than a dozen commercial streets in the city met over the weekend on Park Ave. to plot a strategy they hope will persuade the Tremblay administration to eliminate or steeply reduce the hikes. In order to achieve their goal, the meeting participants - from as far away as Cote St. Luc, Ahuntsic and east-end neighbourhoods - agreed to adopt some of the grassroots cyber-lobbying tactics successfully employed to oppose the renaming of Park. There were also preliminary discussions to try to find a mayoral alternative to Tremblay for the 2010 municipal election. Small-business merchants aren't just upset with the new parking fees. Non-residential property owners are still reeling from property-tax increases as high as 35 per cent for 2007. "The city likes to say the new parking rates are simply in line with those in Toronto and Vancouver; but you're talking about cities there with much higher standards of living than Montreal," said Chris Karidogiannis, executive secretary of the Park Avenue Merchants Association. Out of the meeting, said Karidogiannis, came a new verb - to "parkavenue" something, which was understood by all to mean embracing the tools of the Internet to support grassroots activism. The parking issue has begun to assume a much higher media profile in recent weeks. 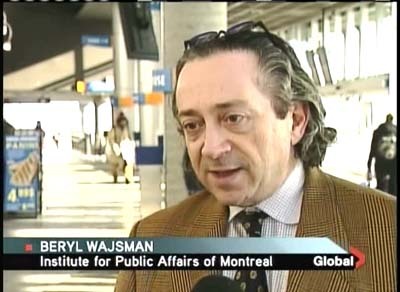 On French-language radio, populist firebrand Gilles Proulx has been hammering away at the Tremblay administration; on English radio, Beryl Wajsman has been carrying the torch on AM 940 Montreal. "Basically, this is a group of disgruntled citizens who have a good reason to be disgruntled," said Wajsman, whose show, The Last Angry Man, runs from 7 to 8 p.m. Monday through Thursday. Giancaspro, who was on Proulx's show last Tuesday, the day before her three-day petition blitz began, said yesterday: "Every single merchant in every single store (i.e. along Fleury, between St. Hubert St. and Christophe Colomb Ave.) has a sign posted saying they have a petition inside to sign." Petition missionaries are going to be sent this week into west-end districts like Notre Dame de Grace. The last time merchants were as upset as they are now was in 1993, when former mayor Jean Dore introduced a surtax on the existing Montreal business tax, in order to keep a lid on residential tax increases. That surtax, calculated as a percentage of rental values, ultimately helped topple the Dore administration. His successor, Pierre Bourque, cut the surtax by 80 per cent. 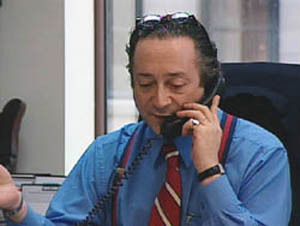 In 2003, the Tremblay administration did away with the business tax, but uploaded it into the non-residential property tax. Non-residential landlords were told they could raise their commercial rents in order to make up for the uploaded tax burden. That burden, adjusted for inflation, is now equal to what the combined 1993 surtax, business tax and non-residential-property- tax burden was under the Dore administration. But landlords haven't had much latitude to raise rents. Merchants are also struggling to compete with big-box retailers that didn't exist in Quebec in 1993, and with supermarkets whose operating hours aren't as restricted as in 1993. This past winter, rents have fallen as much as 25 per cent, particularly where depanneur businesses are concerned, according to Spiros Papadopoulos, a Sherbrooke St. E. commercial landlord who attended Saturday's meeting at Le Coin Grec restaurant, at the corner of Park and St. Joseph Blvd. Karidogiannis said the Tremblay administration seems to care more about helping Laval residents commute quickly up and down reserved lanes on Park than it does about responding to the anxieties of people who earn their living on the street. 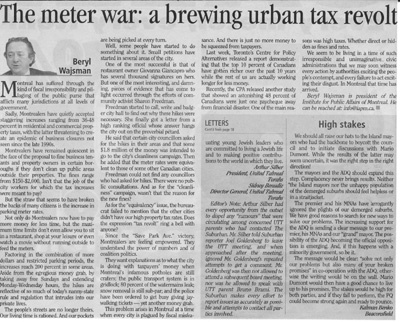 Wajsman, who is also president of the Institute for Public Affairs of Montreal, said merchants have begun a fundraising effort in order to purchase advertising in Montreal media that will draw attention to the emerging online petition relating to parking-meter increases. The cyberpetition could be up and running by the end of this week, according to Karidogiannis and Wajsman.